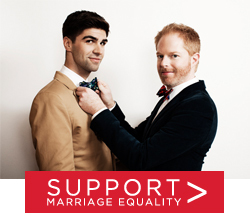 Beginning April 16, all proceeds made through any purchases with Tie The Knot will be donated by Jesse Tyler Ferguson and his husband, Justin Mikita, to the American Foundation for Equal Rights. Jesse and Justin are committed advocates for marriage equality. Tie The Knot raises funds to achieve marriage equality through the sale of limited edition bow ties, and the pair has been donating to various organizations since Tie The Knot’s founding. As AFER gears up for oral arguments in the Bostic case at the U.S. Court of Appeals for the Fourth Circuit, Jesse and Justin have committed yet again to supporting AFER’s work in hopes of achieving full equality for all Americans. Visit tietheknot.org to learn more about the organization. The campaign runs until our Circuit Court hearing on May 13, 2014. Click here to purchase your new limited edition bow tie and to support equal rights for all Americans.